Then my mother told me her story. In the 1960’s she became pregnant out of wedlock. She was born and raised in a small northern Ontario town and raised Catholic. Back then being a single mother was frowned upon. Being from a very small town everyone seemed to know everyone’s business and mistakes or indiscretions would follow you where you went. So she made a decision to move away, have the baby, then put it up for adoption. In 1996 she received a phone call from a woman named Jeannie Lachman. After years of searching Jeannie had discovered that my mother was her birth mother. Jeannie was put up for adoption in the United States. She was raised always knowing she was adopted. She felt loved and accepted but felt a void like something was missing. After giving birth to her first child she felt a pressing need to know her genetic history. After many phone calls and letters and research she finally got some helpful information that lead to her finding my mom. At first I was in disbelief, then felt betrayed. How could my mother keep such a secret from me for all these years? I had so many questions but my mom shut down and would not discuss the details or the birth father. All she was willing to tell me was that Jeannie and I did not share the same father. My questions were upsetting her so I just let things be. Immediately I felt protective of her. Who was this woman who entered my mom’s life? What did she want? Was she bitter about being given up? Would she want to know me? Would she resent me for being kept? I needed to know more. I decided to reach out by writing her a letter, and we began to correspond. Over the next year Jeannie and my mom would develop a relationship over the phone. Standing by my mother’s side through all of this, I opened my home for their reunion. We were all nervous to meet face to face. The day finally arrived when we would meet. I was worried for my mom. She would now have to face the daughter she had given up. I wondered if it would bring back painful memories. Jeannie would have questions and it was time for my mother to answer. As I watched my mom look out the window waiting for Jeannie’s arrival, I saw a frail-looking woman. This had taken a toll on her. Witnessing their initial embrace was a beautiful sight. Both women had found a missing puzzle piece to their lives. Jeannie was kind and gentle with my mom and this put me at ease. Over the next few days our two families bonded and shared details of our lives. We all felt mutually blessed to have found each other. I felt an instant connection with my new found sister. Relationships developed quickly after our first meeting. Because we lived in two different countries we relied on modern technology to keep in touch. Emailing and instant messaging would become a daily thing for Jeannie and me. We began writing about our lives and swapping stories to get to know each other better. This would continue on even after we had become a part of each other’s lives. It gave us the opportunity to share our feelings about events that we had shared. Jeannie had found her birth mother and a sister, but there was still a lingering question about who her birth father was. We had often discussed her desire to know. It was during my first visit to Jeannie’s house that she shared with me the box of information that had led her to my mother. It also contained non-identifying information about her birth father. My mother was still not willing to discuss the details. Even when my mother was on her death bed she refused to reveal the name. There were family members who knew but followed suit. No one wanted to break their promise to a dying woman. This would become one of the biggest stumbling blocks my sister would face. She came to visit my mother during her last days with hopes of getting some answers but this was not to be. I sat by my mothers bedside as she lay there in a coma and it was as if fate had intervened. Someone in the room had made a comment and in my mind I flashed back to information that my sister shared with me years before. I had just discovered a key clue that would lead me to Jeannie’s birth fathers name. I was now faced with a decision; do I tell Jeannie or do I keep the secret that has been kept hidden for so many years? Despite feelings of guilt and betrayal my sisterly bond was stronger and I embarked on a journey with my sister to help her discover the missing links in her identity. Standing by my sister’s side as she made contact with her birth father and his family strengthened our bond as sisters, and I was able to make peace with my decision. In my heart I know that my mother is smiling down knowing that I did the right thing with the information that seemed to fall into my hands. She knew I would do the right thing. My mother was from an era in which adoption was kept as a secret and not talked about. It is our hope that our story will inspire all who are affected by adoption. Carole Sanguedolce (on the right) is a wife, mother, and works as a book keeper in Toronto. 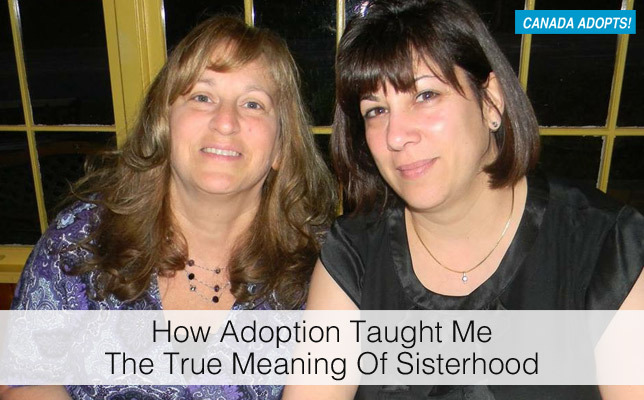 She is the co-author, with Jeannie Lachman, of Two Peas in a Separated Pod: A True story of Adoption.